I'm going to take this down very shortly for safety reasons. In the meantime, I'd like you to meet my son, Lucas. 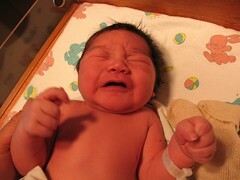 He's quite unhappy here, but wouldn't you be after 38 hours of labor? It was quite an ordeal for Meredith, and I won't go into many details so publicly. At any rate, the outcome was a good one--healthy mother, healthy baby. I slept for the first time in two nights last night, but from what everyone tells me, I won't be getting much more for the next year or so. Anyway, thanks for all your notes of encouragement while Mere and I were waiting.